Stone & Slate Discounts have used Bluestone drop face pool edge coping tiles and white granite pool paving on this pool renovation in Port Macquarie. The drop face pool coping tiles used on this swimming pool were actually 1000mm x 350mm x 100mm drop with 500mm x 500mm x 18mm white granite pavers. Himalayan Sandstone drop face rebated pool edge coping tiles have been used here with raven grey flamed granite pool paving pavers. The rebated drop face pool coping tiles are Stocked in 600mm x 400 x 40/20mm. Current SALE Price $33ea piece inc GST. Light Teakwood Sandstone drop face rebated pool edge coping pavers with matching Teakwood Sandstone pool pavers have been used on this pool renovation in Port Macquarie. THe Teakwood pool coping tiles are Stocked in 600mm x 350mm x 40/20mm. Price $38ea piece inc GST. The matching Light Teakwood pavers used are 500mm x 500mm x 17mm. Exfoliated Raven Grey granite drop face pool edge coping tiles. The pool coping tiles are stocked in 500mm x 500mm x 40/20mm. Price $44ea piece inc GST OR 800mm x 400mm x 40/20mm. Price $49ea piece inc GST. On this swimming pool we used drop face pool coping tiles that were 1000mm x 500mm x 100/20mm. Exfoliated Summer granite drop face rebated pool edge coping tiles with a curved pool coping on the Spa and surrounded by summer granite pool pavers. The pool coping tiles are stocked in 500mm x 500mm x 40/20mm. Price $48ea piece inc GST OR 800mm x 400mm x 40/20mm. Price $58ea piece inc GST. On this swimming pool we have used 800mm x 350mm x 40/20 pool edge coping tiles with matching semi ashlar pattern pool pavers. 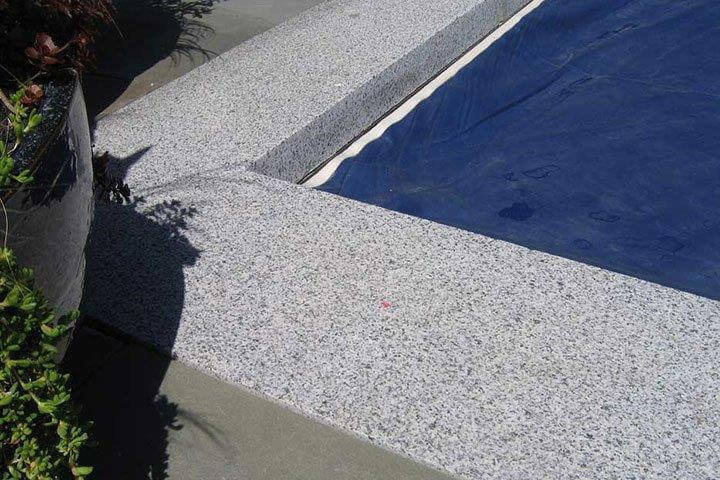 Exfoliated and Enhanced Raven Grey Granite drop face rebated pool edge coping tiles have been used as a highlight along with yellow limestone acid washed pool coping tiles and paving. Stocked in 500mm x 500mm x 40/20mm. Price $46ea piece inc GST OR 800mm x 400mm x 40/20mm. Price $52ea piece inc GST. Exfoliated Dove White granite pool edge coping tiles with a drop face of 100mm have been used on this pool. We stock the Dove White drop face pool coping tiles in 500mm x 500mm x 40/20mm. Price $48 ea piece inc GST OR 800mm x 400mm x 40/20mm. Price $59ea piece inc GST. Genuine Harkaway Bluestone custom made curved drop face pool edge coping tiles cut from a template supplied by your client. Price based upon request. Turn around time of around 6-8 weeks and can be selected with or without catspaw air holing. CURVED custom made Bluestone pool edge pavers and matching bluestone pool pavers. Price based upon request. Turn around time of around 4-6 weeks. Straight bullnose stocked; 500x500x30mm Price $24ea pc, 600x300x30mm Price $19ea pc, 800x400x30mm Price $29ea pc, 1000x500x30mm Price $40ea pc, 1800x350x30mm $90ea pc. Other sizes by request. Stone & Slate Discounts have used Himalayan Sandstone bullnose pool edge coping and matching Himalayan sandstone pool pavers along with matching sandstone step treads. Straight bullnose sizes available 500x500x30mm Price $19ea pc, 600x400x30mm Price $20ea pc. Other sizes by request. Stone & Slate Discounts have used Summer Granite with an exfoliated non slip pool edge coping and summer granite pool pavers on this pool renovation in Port Macquarie. Sizes available 500x500x30mm Price $30ea pc, 600x300x30mm Price $39ea pc, 800x400x30mm Price $44ea pc, Other sizes by request. Travertine Bullnose pool edge coping tiles with matching Travertine pool pavers highlight this Mediterranean look. 600x310x30mm Price $33ea pc, 610x406x30mm Price $39ea pc. Stone & Slate Discounts have used Teakwood Sandstone pool edge coping tiles and matching Teakwood sandstone non slip pool pavers with a pebble insert. 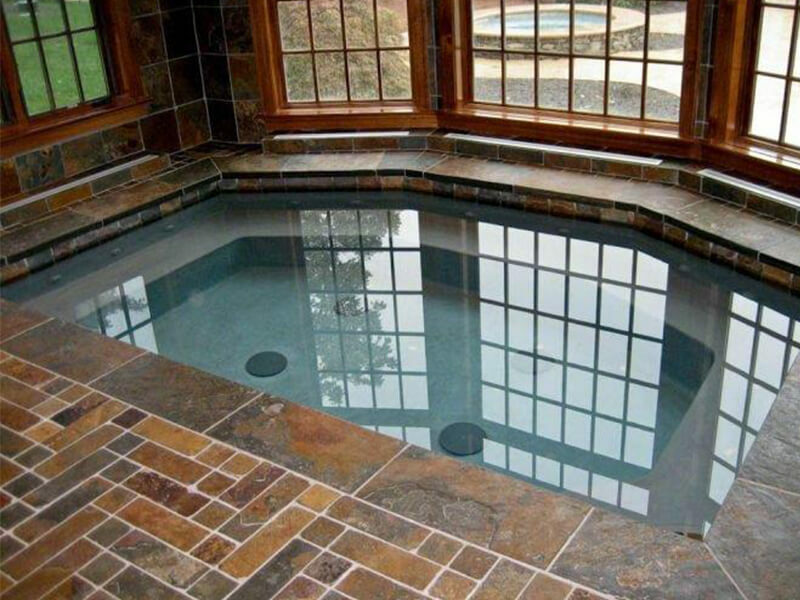 Pool coping tiles sizes available 500x500x30mm Price $28ea pc, 600x400x30mm Price $32ea pc. Other sizes by request. Raven Grey Granite pool edge coping tiles and pavers with contrasting Brazillian Quartzite crazy paving surround this pool renovation in Port Macquarie. Pool Coping Tiles sizes available 500x500x30mm Price $32ea pc, 600x300x30mm Price $39ea pc, 800x400x30mm Price $42ea pc, Other sizes by request. Dove white granite bullnose pool edge coping tiles and matching Dove White granite pool paving. Sizes available 500x500x30mm Price $32a pc, 600x300x30mm Price $39ea pc, 800x400x30mm Price $42ea pc, Other sizes by request. Stone & Slate Discounts have used White diamond granite bullnose pool edge coping and pool pavers on this pool renovation in Port Macquarie. Also we have used curved white diamond granite custom made pool edge coping tiles on another project. Sizes available 800x400x30mm Price $69ea pc, 500x500x30mm Price $59ea pc. Other sizes by request. White Limestone square edge pool coping tiles with a 5mm aris to the top and bottom edges and matching white limestone non slip pool pavers. Sizes available 800x400x30mm Price $79ea pc, 500x500x30mm Price $69ea pc. Other sizes by request. Stone & Slate Discounts have used Brazillian Quaurtzite Bullnose pool edge coping and matching Brazillian Quartzite pool paving tiles. Size stocked 600x400x30mm Price $36ea pc. Other sizes by request. Stone & Slate Discounts have used Kakadu Slate bullnose pool edge coping tiles and matching Kakadu pool paving tiles. Size stocked 600x400x30mm Price $36ea pc. Other sizes by request. Enhanced raven grey granite pool edge coping tiles and matching Raven grey granite enhanced pool surround pavers. Sizes available 500x500x30mm Price $34ea pc, 600x300x30mm Price $39ea pc, 800x400x30mm Price $46ea pc, Other sizes by request. Please note that some of the above swimming pools have been renovated whilst others are new pools. Our manager Steve Taylor ( Master Stonemason) still runs a qualified team of pool tiles if you require installation. (from the pictures above). Stone & Slate Discounts have the best Price for Quality Pool Coping and Pool Pavers in Port Macquarie. We deliver door to door. Stone & Slate Discounts can offer you the best price for your pool pavers and pool edge coping tiles since we are the largest importer/wholesaler in Australia. We stock pool coping pavers for both fibreglass and concrete pools and can custom make curved coping tiles if required. We employ dedicated industry specialists, such as expert stonemasons, to help you make the right decisions for your pool edge coping, new pool installation or pool reovations in Port Macquarie. They will advise you not only on selecting the right stone pool paver or swimming pool coping but also on the correct installation procedures. Door to door delivery into Port Macquarie is not a problem. We deliver to ALL country towns as well. We stock the following types of natural stone pool edge coping and pool pavers with a drop face, bullnose or square edge: Bluestone ( Both Chinese and HARKAWAY), Sandstone ( Natural split surface and Honed smooth surface), Granite, Limestone, Travertine, Slate.